3. Choose the statement regarding duty to rescue that is false: a. There is no general duty to rescue an individual. b. One basis for not imposing individual rescue liability is: An individual should have a right of freedom of action, privacy and personal autonomy not to intervene and perform rescue. c. Under a liberalâ&#x20AC;&#x201C;communitarian approach, citizens owe a duty to the state to rescue other citizens based on reciprocal rights and duties. 6. Which of the following statements best illustrates the view of “utilitarianism”? I. II. From each according to his abilities, to each according to his needs. The risk reasonably to be perceived defines the duty to be obeyed and risks imports relation; it is risk to another or to others within the range of apprehension. An action is right when maximizing welfare and total well-being. Individuals should pursue his or her own self-interest, even at the expense of others. 7. The best example of a source for virtue ethics for a business is a. newspapers articles about the corporation. b. the corporate mission statement. c. the documentation in human resources justifying the hiring of new staff. d. the resumes of the members of the board of directors and the officers. 8. The Ethic of Care is a. A set of rules that explain how to prioritize those people affected by a decision so that a utilitarian analysis can be done successfully. b. A set of universal principles, which applied evenly to all decisions will result in fairness and equity in ethical decisions. c. The idea that we should all make decisions under the assumption that we donâ&#x20AC;&#x2122;t know our station in life, that we could be the person most negatively impacted by the decision. 10. Which of the following statements is INCORRECT regarding the rights of shareholders? I. II. III. 11. According to Citizens United v. Federal Election Commission, which of the following is not a reason to allow corporations the right to spend money and advertise for political candidates? Essay Questions 13. 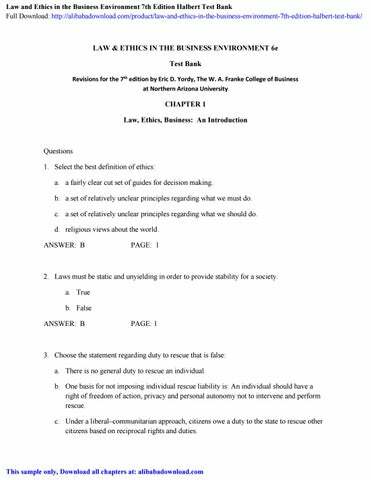 Describe the difference between the law and ethics.